EXPLORE the vibrant and historic Queen Victoria (QV) market, a colorful and popular destination for visitors and a food heaven. FIND OUT about current proposals for extensive redevelopment of the site proposed by the Melbourne City Council. LEARN the history of Melbourne’s many markets since settlement eg Western, Eastern, Paddy’s, Fish, Hantons, Kirks horse market, Hay and Corn and others. DISCOVER the Old Melbourne Cemetery 1837-1922, today largely under the Market’s car park. We visit the former sites and read gravestone epitaphs which honour our pioneer women, men and children. VISIT nearby beautiful and historic Flagstaff Gardens, the site of Melbourne’s first cemetery, park, signal station and observatory. LEARN about the significant Aboriginal heritage of the market. Melbourne remains a Market town with many large municipal markets including South Melbourne, Prahran and Dandenong Markets. However, Queen Victoria Market is the largest and most intact of all Melbourne’s great 19th century markets. 1857 Market allotment allocated. Used as livestock and hay market. 1868 Retail Meat and Fish Market and slaughterhouse. 1969 Wholesale Market Footscray (relocated from Queen Victoria) following Royal Commission). 1929-30 Wholesale agents and merchants brick stores (60) on car park. The Lower Market (bounded by Elizabeth, Victoria, Queen and Therry Streets) is the oldest part of the Market. It was originally set aside in 1857 for a fruit and vegetable market due to over-crowding and congestion at the Eastern Market but the location was unpopular and the market gardeners wouldn’t use it. Instead, it was used as a livestock and hay market until it was permanently reserved as a Market in 1867. The following year, a substantial brick building was erected on Elizabeth Street and this became a Wholesale Meat Market. However, the wholesale meat trade soon became dissatisfied with the site and relocated to the Metropolitan Meat Market building in Courtney Street, North Melbourne. The building was then turned over to a Retail Meat and Fish Market and slaughterhouse. In 1878, the Market sheds G, H, I & J were built on the site and wholesaling and retailing of fruit and vegetables occurred for the first time. While H & I Sheds still stand, G Shed was removed to construct the current Meat Hall loading bay and a block of public toilets. The original J Shed burnt down and is now a public plaza. In 1880, the Elizabeth Street shops were constructed following the realignment of Elizabeth Street. This also allowed the Meat Hall to be extended, and the present facade to be constructed in 1884. The Dairy Produce Hall (also known as the Deli Hall) was the last of the buildings to be built on this part of the Market, and was constructed in 1929. The Upper Market (bounded by Queen, Victoria, Peel and Franklin Streets) was not originally reserved as a market but had a number of other uses including a school and drill hall. Its predominant use, however, was as Melbourne’s first cemetery. Construction of A-F sheds began in 1877 at the northern-most edge of the Market. This site was chosen because it contained the school, drill hall and the least-used section of the cemetery. By 1930, the remainder of the site had been built upon. Between 1903 and 1905 A-C Sheds were extended to Peel Street, while D-F Sheds were not extended until 1922. That same year, the Queen Street and Peel Street verandahs were also constructed. The roofing of the centreway occurred in 1927. In 1929-1930 the large K and L Sheds were constructed for growers. In 1929-30, the City of Melbourne constructed 60 brick stores on the current car park to house the wholesale agents and merchants. However, allegations of corruption and racketeering and a Royal Commission in 1960 led to the decision to relocate the Wholesale Market to Footscray in 1969. A single row of the Agents stores along Franklin Street is all that remains of the Merchants section of the Market. The separation of the Wholesale Market from the Retail Market lead to a plan to redevelop the Queen Victoria Market site into a trade centre, office and hotel complex in the 1970s. However, public outcry prevented this and resulted in the Market being classified by the National Trust. Later, the Market site and its buildings were listed on the Historic Buildings Register.Queen Victoria Market survives today as one of the largest and most intact examples of Melbourne’s great nineteenth century markets. The Queen Victoria Market site is listed as a historic place by Heritage Victoria. Many of the buildings are listed as notable buildings on the Historic Building Register of Victoria. One of the most intriguing stages in Queen Victoria Market’s history was during the 1960s, when the Market was associated with the infamous “Honoured Society”. Indeed, much of the innuendo and rumour surrounding the Market today can be attributed to this period. It all began in 1960, when the complaining of suspicious growers unhappy with the handling of their consignments resulted in a Royal Commission being established to investigate price fixing at the Wholesale section of the Market. Then, in 1963, a stallholder was shot. This was the first of 5 shootings associated with the Market. These shootings, it is claimed, were carried out by the “Honoured Society”, some of whose members had entered Australia through an illegal immigration racket and were using extortion to cheat immigrant Italian growers out of thousands of dollars. Between the years of 1837 and 1854, much of the land on which the Queen Victoria Market now stands was the site of Melbourne’s first official cemetery, which housed the remains of an estimated 10,000 early settlers, including those of John Batman. In 1917, when that Market was extended upon much of the cemetery site, 914 bodies were exhumed and re-interred at other cemeteries around Melbourne, including Melbourne General Cemetery in Carlton, and Fawkner Cemetery, which is now the resting place of the “Old Pioneers”. Numerous bodies remain buried beneath the existing car park. Unfortunately, there are limited records of those buried there. Following its closure, the Cemetery fell into disuse and many of the red gum head stones were stolen for firewood. Official records for the cemetery were destroyed during a fire in one of the wings of the Melbourne Town Hall. 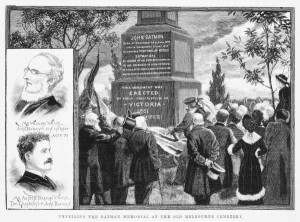 Today, the John Batman memorial is housed on the north east corner of the car park site, and a further memorial “Passage” to the numerous persons still buried on the site is situated on the corner of Queen and Therry Street. Queen Victoria Market holds many remains of European founders of Melbourne as well as Aboriginal graves. The human remains of an estimated 9000 people are on the sites. Bizarrely most of them lie as little as 1.5 metres below the QV Market car park and adjacent market stalls. Thousands of vehicles regularly park above human bodies. How this happened is an extraordinary tale. Fortunately we have all the maps, images, stories, records and grave inscriptions to bring this story and the memories of our founding fathers and mothers to life. This is a significant story that needs revealing not just to show respect, not just to learn how greed triumphed over decency but importantly because the QV Market and Melbourne City Council are planning to use cemetery land for development. Melbourne’s first cemetery: Flagstaff Gardens 1836-7. Willie, the child of James Goodman was the first person to buried in Melbourne, Port Phillip District. He was buried on 13th May 1836 at the very first cemetery at Burial Hill which is today’s Flagstaff Gardens west of the market. Flagstaff was only used for about 8 burials. There is a memorial on the hill. A second cemetery ‘Old Melbourne Cemetery’ was established in 1837 in West Melbourne bounded by Queen Street to the east, Peel Street to the west, Franklin Street to the south, and Fulton Street(which no longer exists) to the north. The first person to be buried on this site was also a child. He was Frederick William Craig, the infant son of Skene Craig. 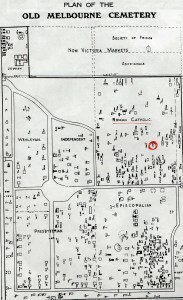 The Old Melbourne Cemetery (QV Market) was divided into areas according to religious denominations. It was the first of this kind in Australia. Two acres each were given to the Church of England, Presbyterians, Roman Catholics and one acre each was given to the Jews, Quakers, Methodists and Independents. Later half the Quaker section was allocated to the Aborigines. We visit each section and read the inscriptions for former headstones and discuss key personalities and events. The Old Melbourne Cemetery (QV Market) was closed in 1854 as it was full, then re-opened in 1864 for the sale of new plots, re-closed in 1867, with the final burial taking place in 1917. A third cemetery – Melbourne General Cemetery in Carlton was opened on 1st June 1853 to meet demand. A Crown grant had been passed providing land for a nearby general market on 4th March 1867. Today’s meat hall dates back to 1869. When the QV Market first expanded into the cemetery in 1878, it was the northern part, the Quaker/Aborigine area near Fulton Street which it acquired first.Two grants that provided more land for the market, were dated 1878 and 1880 (see Queen Victoria Market Lands Act 1996 – Act No. 78/1996 at www.dms.dpc.vic.gov.au). Legislation was passed requiring all bodies in the Old Cemetery to be exhumed. Transcriptions of legible headstones made by G. P. Townend. A gentleman in his late 60’s he saw the urgency of making a record of these markers. From 1920-22, 914 graves with identifying monuments were re-interred at Fawkner, Kew, St. Kilda, Cheltenham and the Melbourne General Cemetery. Many of the headstones crumbled when shifted. At this stage, the cemetery was in a terrible state of neglect, with very long grass. Identification of the burial plots was made difficult because the register of burials prior to 1866 was lost or destroyed. Many graves were unmarked. Others had ‘headstones’ of red gum, which had weathered away. As there were about 10,000 burials on the site, there still remain approximately 9,000 people buried under the sheds and car park of the Queen Victoria Market. When any work is carried out at the market, bones are often disturbed. It was closed permanently in 1922. A Market Bill was rushed though parliament to overcome protests by groups formed to protect the heritage of the site. Isaac Selby wrote an extensive book called “Old Pioneers Memorial History of Melbourne” about the market site. This was part of an extensive campaign to alert the people ofMelbourneto the site’s significance. In 1996, the previous Crown grants were revoked and the Queen Victoria Market Lands Act 1996 came into being. A sculpture memorial to the deceased called ‘Passages’ stands on the corner o fQueen Street and Therry Street. Melbourne City Council announces it is considering a proposal to convert the site into a supermarket with a huge underground car park. This would effectively destroy or remove any remains of the 9000 early settlers. They are still working on development proposals (2012). – Marjorie Morgan’s book, “The Old Melbourne Cemetery 1837 – 1922” published by the Australian Institute of Genealogical Studies in 1982, has names of people buried there from transcriptions of legible headstones made by G. P. Townend in 1913-14. – Isaac Selby wrote a book called “Old Pioneers Memorial History of Melbourne” in 1924 which extensively outines the history of persons connected to the cemetery. – Royal Historical Society of Victoria’s Historical Magazine, Volume 9, No. 1, pages 40-47 has an article on the cemetery.